Hello friends! This weekend is a big shopping season in the United States. If you’re like me, you mostly stay out of the way of the crowds, but that doesn’t have to stop you from enjoying savings at these small businesses online. 25% off Select Bundles on Black Friday! 30% off everything in the store on Cyber Monday! 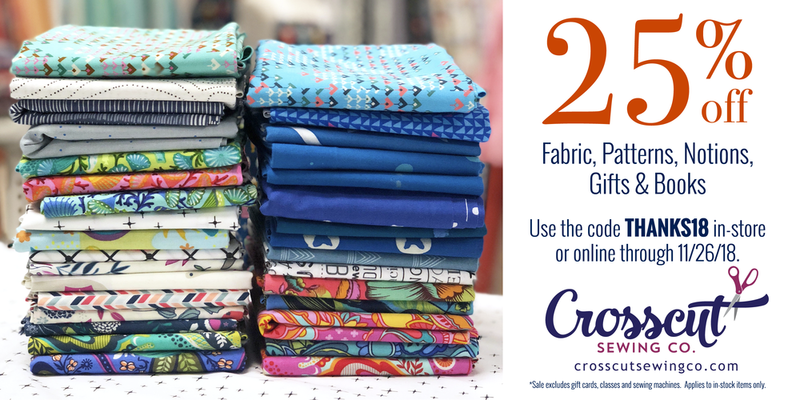 25% on all books, patterns, notions and of course fabric! The sale even applies to already discounted sale items. Use the code THANKS18. Daily Deals start now and continue through November 29th! Today nab 20% off Clearance items with Free Shipping on orders over $25. 25% off everything, now through November 30th. Use code TURKEYLEG, and enjoy your time with family and friends! Please allow extra processing time as they will also be spending the holiday with family. Announcing the launch of a NEW Fabricworm website this week! To celebrate, use code 10YEARS to save $10 off $50. Plus, now through Cyber Monday, ALL sale sections at least 30-65% off.